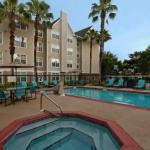 The 99-all suites Residence Inn by Marriott Orlando East University of Central Florida caters to the longer-stay business and leisure traveler with suites that offer separate sleeping, living and dining areas. The four-story, non-smoking property is located in the Quadrangle Office Park and minutes from the University of Central Florida campus. Items included in the room rate are high-speed Internet access, a hot breakfast buffet, local telephone calls, a morning newspaper, local telephone calls, parking and fresh-baked cookies available in the hotels gatehouse every evening. There are three golf courses a short drive from the property. The inn is not too far from Mickey and his friends at Disney World and all the other Orlando attractions. Cocoa Beach and the Kennedy Space Center are 45 miles to the east. All the suites have a fully equipped kitchen with microwave oven, stove, refrigerator with icemaker, dishwasher, toaster, coffeemaker and a full set of cutlery and crockery. There is a separate work area with high-speed Internet access, two-line telephone with voicemail and speakerphone, pullout sofa bed, 27-inch television with cable movie and news channels, hairdryer and an iron and ironing board. The inn has an outdoor heated swimming pool, whirlpool and exercise room. The complimentary breakfast is the only meals served here. There are several places to eat nearby including an Applebees, Bennigans, Starbucks Coffee and Unos Pizzeria. The 24-hour front desk has safe deposit boxes, information on area events and attractions, and a list of restaurants that will deliver to the inn. Other amenities include a coin-operated laundry, fax and copying machines available for guest use, a grocery delivery service, coin-operated laundry, valet dry-cleaning, vending machines and a picnic area with barbecue grill.